Gwynedd (Gwyn) Barrowman (nee Price, 1941-2018). Beloved mother of Barbara and her husband Peter Browne, Nicholas and his late wife Gillian Megann and his wife Yvonne Kaethler, David and his wife Caitlin Haberberger; grandmother of Clare, Adam, Daniel, Ian, Hannah, Maya, Hanan, and Daisy; sister of Gareth (Buffy) and his wife Sheila, and Trevor and his wife Lesley. Predeceased by her beloved husband Dr. James (Jim) Barrowman, daughter Judith, and brother David. Gwyn was a woman of quiet faith who, instead of dwelling on her own hardships, focused on helping others. She was known by all for her friendliness, humility, generosity, dry but warm sense of humour, and enthusiastic approach to life. A firm believer in concrete action, Gwyn worked as a volunteer in Bangladesh and Ethiopia. She loved the outdoors and especially the natural environment of Newfoundland, and was an avid gardener. Gwyn had a keen mind and believed strongly in science. She practised as a physiotherapist, and later earned two Master’s degrees in science. Gwyn’s life was multifaceted; she actively participated in the St. Thomas’ Church Choir, the Commonwealth Society, the MUN Pensioners’ Association, Friends of the Garden, the Tuckamore Festival, the Grandmothers to Grandmothers Campaign, the Saturday-morning coffee group, the Friday-night movie group, the Tuesday-night supper group, and other groups and activities. “Goodie” was a devoted grandmother who spent large amounts of time with her grandchildren in St. John’s, Ottawa, and Oakland. She was often seen walking her four-legged friend, Buddy, around Quidi Vidi Lake and Signal Hill. Gwyn was an inspiration to her family and others. She was dearly loved and will be missed by a large circle of family and friends. Her family extends heartfelt thanks to the healthcare professionals at the Health Sciences Centre for their kindness and diligence. Cremation has taken place. Visitation will be held at Carnell’s Funeral Home, 329 Freshwater Road, on Friday October 12th from 7 – 9 pm and Saturday October 13th from 2 – 4 pm and 7 – 9 pm. Funeral Service will be held at St. Thomas’ Anglican Church, 8 Military Road, on Monday October 15th at 10 am. As an expression of sympathy, donations in Gwyn’s memory may be made to The Primate’s World Relief and Development Fund, the Grandmothers Campaign (an initiative of the Stephen Lewis Foundation), or the MUN Botanical Garden. I am so sorry to hear of your mother’s passing. May your cherished memories comfort you. We were so saddened to learn of Gwyn’s passing. Our deepest condolences to the family. You know how sorry I am to hear of your mother’s passing- you are all in my thoughts and prayers. I have been away at a meeting so unable to attend visitation but have been thinking of you- I know how terribly difficult it is to lose your mother…. I was so sad to hear of your Mom’s passing. I have such fond memories of your Mother as a ‘friend’s’ Mom, a fellow grad student and a professional colleague. Every role your Mom assumed was done with both passion and positivity. Thinking of you all at this time. We were saddened to hear of your Mom’s passing. Our thoughts and prayers are with you all. Sorry to hear of your mother’s passing. Our thoughts and prayers are with you at this time. Over the years working with Daniel or assisting the church choir, I enjoyed countless fleeting moments with Gwyn. She may have been picking up Daniel from his piano lesson and dropping in to say hello, or dashing around before the church service making sure everyone’s music was in order, taking her place in the rehearsal room, and smiling at me waiting for my direction and hanging on every word. Or, as she did just a few weeks ago, would linger well after the service to say hello and chat with me and Joan.. Highly respected throughout her remarkable life, she was equally respectful of all others. My fleeting moments with her were many and made that entire day brighter every single time. She was a delight and an inspiration. She is missed but leaves behind a wonderful legacy in her love of family, love of friends, love of life, selflessness, and pure decency and goodness. I am away and regret that I am unable to share in the celebration of her life, but you are all on my mind and in my heart. My late husband, Dr. Peter Roberts, and I were in England on our honeymoon in 1973. Gwyn and Jim were so very kind and welcoming during this time,inviting us to lunch and taking good care of us. I shall always remember Gwyn’s warmth and sweetness. She was a very lovely woman. There are fond memories of her visits to 8 Kenna’s Hill in St. John’s, She will be sadly missed by many, My deepest sympathy to you all during this hard time. My thoughts and prayers are with you . Paul and I extend our deepest condolences to you , Peter , Daniel , Ian and Hannah . We were so saddened to hear of Gwyn’s passing. She was indeed a lovely lady, with, as the obituary says, a quiet faith and concrete action. We had some great times in the choir at St. Thomas’, and will remember her fondly. Our deepest condolences to her family and friends. Our thoughts and prayers are with you. Rest in peace, Gwyn. Sorry to here of your mother’s. My thoughts and prayers are with you at this time. I am on holidays. Barbara & Family; Jeanette and I are deeply shocked and saddened upon hearing of your dear mother’s passing.Gwyn was always so pleasant and positive and her beautiful smile would light up a room. Her boundless energy was displayed in her gardening projects and the quality time spent with her grand children. 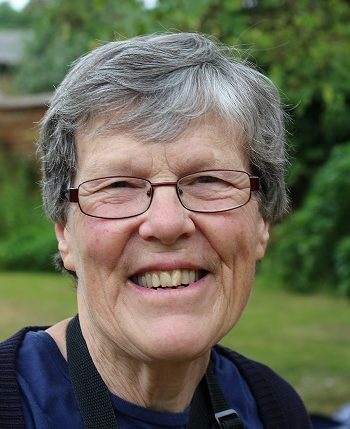 Gwyn was a willing and enthusiastic volunteer at St. Thomas’ Church for many years. Her knowledge and love of music was a blessing to our choir,especially the bass section who sat directly behind the altos. Gwyn would tactfully guide us (always with a smile) through parts where her keen ear detected fine tuning was required. Our Gwyn was a very special lady and will be dearly missed by all who had the privilege of her friendship . May God Bless Gwyn …..”and hold her in the palm of His hand”. by Peter and Jeanette Harvey Langley B.C. I was so sorry to hear of Gwyn’s sudden passing. A great loss to all who knew her. I love the photo posted on this page. That is just how everyone always saw her,, with such a great smile. My deepest sympathy to her family. My heart aches for Gwyn’s family and friends. So very many have been warmed by the spark of Gwyn’s quiet energy and her unending kindness; how lucky we are to have been in her orbit. I am missing Gwyn’s wit, her warm hugs, and her perfect pitch. We were saddened to learn of the passing of your Mother. We have wonderful memories of Gwyn from the early days of Cygnus Gymnastics. It was fortunate to reconnect with her through Hannah and Sophie at both Bishop Field and Shallaway. We are sending you all our deepest condolences at this time. I am so sorry about Gwyn’s passing. Please accept my sincere condolences. I shall miss her as a neighbour and as a sister participant in the Grannie’s Scrabble events. I shall miss her friendliness. I shall miss seeing her energy in the garden, even when it was snow she was handling. I shall miss our little chats and her lovely gentle smile. My thoughts are with you. I’m so sorry to hear of your mom’s passing – my thoughts are with you and your family at this very difficult time. I was deeply sorry to learn of Gwyn’s unexpected passing. Gwyn was a wonderful colleague in her work and dedication to MUNPA. Always with a smile, Gwyn was a pleasure to work with. She will be dearly missed. Deepest condolences to her family. So very sorry to hear of Gwyn’s unexpected passing. She was a wonderful colleague, so patient and kind in her relationships and so diligent in her responsibilities. She will be very much missed, particularly by MUN pensioners for whom she has long been a steady presence and a reliable source of support and information. My sincere sympathy to her family. Heart felt condolences to Gwyn’s family from Garry Chernenko and Judy Blundon.